Have you ever wondered what a war between turtles and armadillos would be like, with shells clashing into one another and battles fought to the bitter end? No? Well, Shell Kingdom, developed and published by Jagames, provides you with that experience whether you asked for it or not. Shell Kingdom tells the tragic story of a nation of turtles who used to live on their turtle island in peace and harmony. One day, they were expelled by the evil armadillos after a devastating military defeat. Now, the time for revenge has come. This elderly turtle will guide you to victory. Revenge comes in form of you, a single turtle. But don’t worry. You will find fellow turtles scattered everywhere, hiding in their shells but ready to join the glorious revolution. Touch them and they fall under your control. 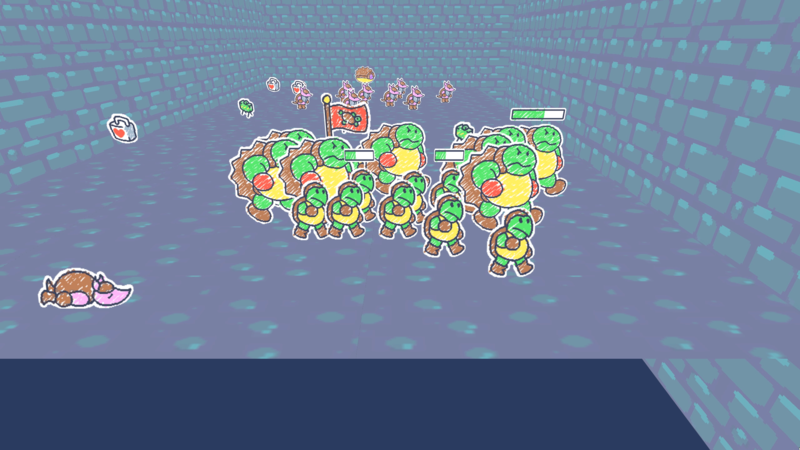 This is where Shell Kingdom gets tricky — you move your initial turtle via WASD controls, and the same goes for every additional member of your chelonian army. Thus, controlling them all at once can be quite the task, as you can’t remove any turtle from the group. Running everyone into walls and corners is essential to cluster your turtles properly. Apart from simple switch puzzles, the core of Shell Kingdom’s gameplay is combat and manoeuvring. As soon as your brave soldiers collide with an armadillo, the two start beating on one another. Once more, you need tactical manoeuvring to swarm the enemy properly. Heavy reinforcements await in the dungeons. After a while, heavy soldiers join the battle on both sides. Additionally, the armadillos place mines everywhere. Overcome them and you will find yourself in the dungeons of the armadillo castle. Master the dungeons and your turtles will liberate the beach and claim victory. All of this is accompanied by the narration of an elderly turtle and member of the revolution’s old guard. Over the top and sometimes just absurd, he adds a lot of charm to Shell Kingdom. 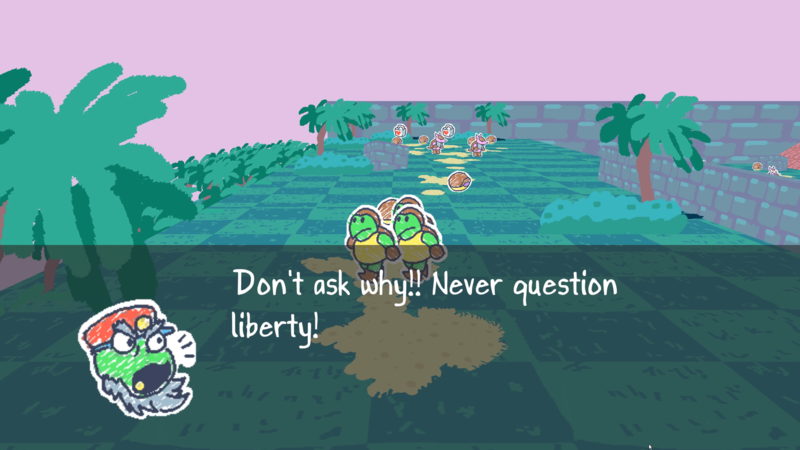 Equally charming are the two-dimensional turtles and armadillos, which look not unlike Paper Mario characters. Shell Kingdom is not a long experience. You can finish it in about fifteen minutes, which is a bit of a shame. While rough, its core idea — having to herd a regiment of angry turtles with intentionally clumsy controls — has potential and could easily be expanded. 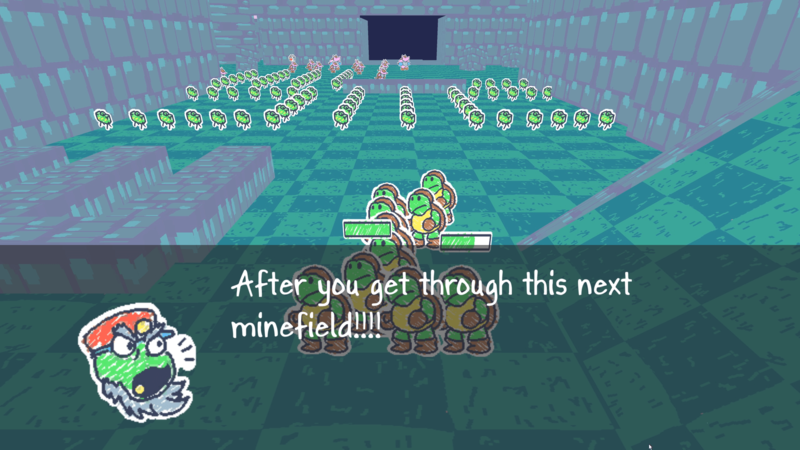 Mines, a turtle’s only weakness! Shell Kingdom’s primary weak spot is probably its combat. Combat is not very satisfying and should be avoided if possible. Some areas are littered with so many mines and enemies that rushing for the exit seems to be the only solution. Formally, Shell Kingdom wants you to raise your flag in every conquered territory, but effectively, reaching the next screen is the only thing that matters. Despite some shortcomings, Shell Kingdom is an adorable little game. It comes free of charge and you should give it a try — unless you are a traitor to the revolution, of course. Shell Kingdom is available now for PC & Mac.